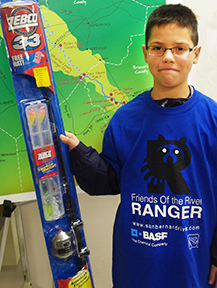 Friends of the River (FOR) San Bernard presented their River Ranger program to seventy-four fifth grade students in teacher Katie Brooker's science classes at Barrow Elementary in Brazoria on Jan. 22, 2015. 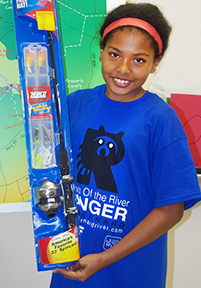 The Ranger program is designed to raise student awareness about the San Bernard River watershed and its environmental concerns. 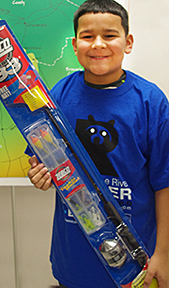 Brochures were distributed that explore the river from its head waters to its mouth. Chairman Adalia Maudlin described the different points-of-interest along the way. Mike Goodson lead the discussion of the types of fish found in the San Bernard River with “mostly-true” fish stories added by the students. Last was an active, hands-on, marine knot-tying session where Ken Wright demonstrated the proper knots used in boating. 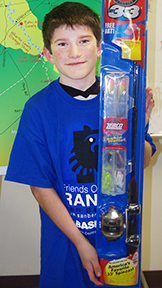 Ranger t-shirts were given to each student and fishing rods were awarded to four lucky students whose names were drawn by teacher Katie Brooker.